The bairns are both wonderfully polite children*. *One of them can't actually speak yet and demands things by squawking at us and finds burps hilarious. And the other sometimes needs a reminder to say please and thank you. They can be a little rude. Like Duck. In How Rude! 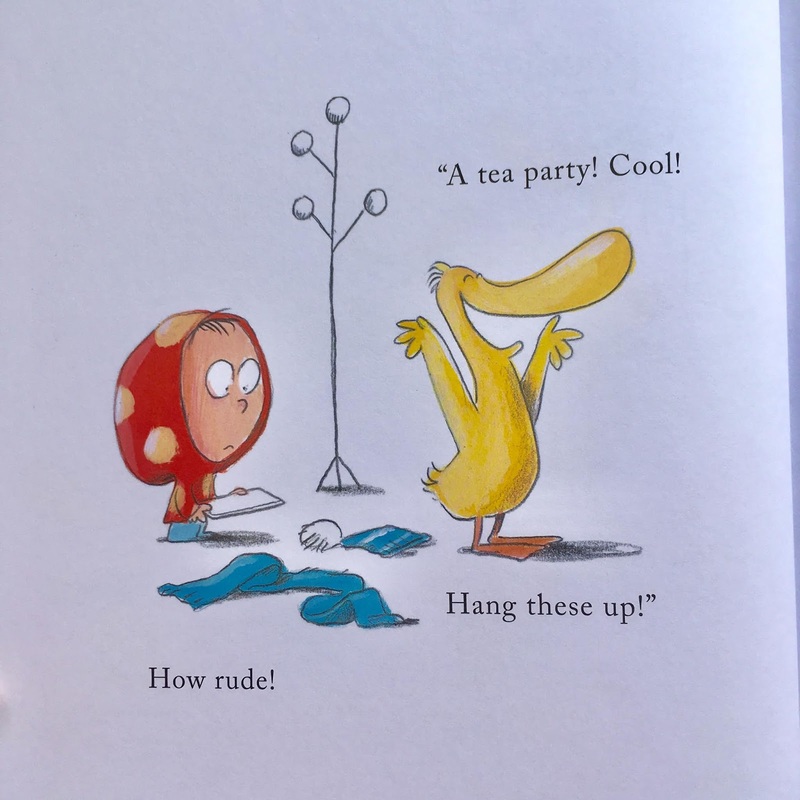 by Clare Helen Welsh & Olivier Tallec, the main character 'Dot' has invited her friend Duck over for a tea party. Dot has no idea just how rude a guest Duck will prove to be. 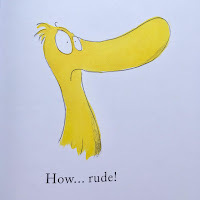 But Duck is being very rude. He throws his coat on the floor, stomps his muddy webbed feet across the carpet, and then puts them up on the table. He rejects the idea of the sandwiches that Dot has made, and then licks them all to taste and then finally scoffs the lot anyway. Meanwhile Dot's shocked eyes grow bigger and bigger, her face grows redder and redder, until eventually a huge storm cloud boils above her head. Just how will Dot react to such rude behaviour? There's one cake left. And Duck has his eyes firmly set on it. 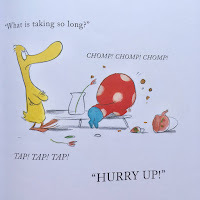 But Dot intervenes scoffing the whole lot and not sharing even a crumb with Duck. How rude! Duck and Dot soon realise that they have both been very rude when they look at the carnage around them. And they apologise. Except for one little burp at the end of course. 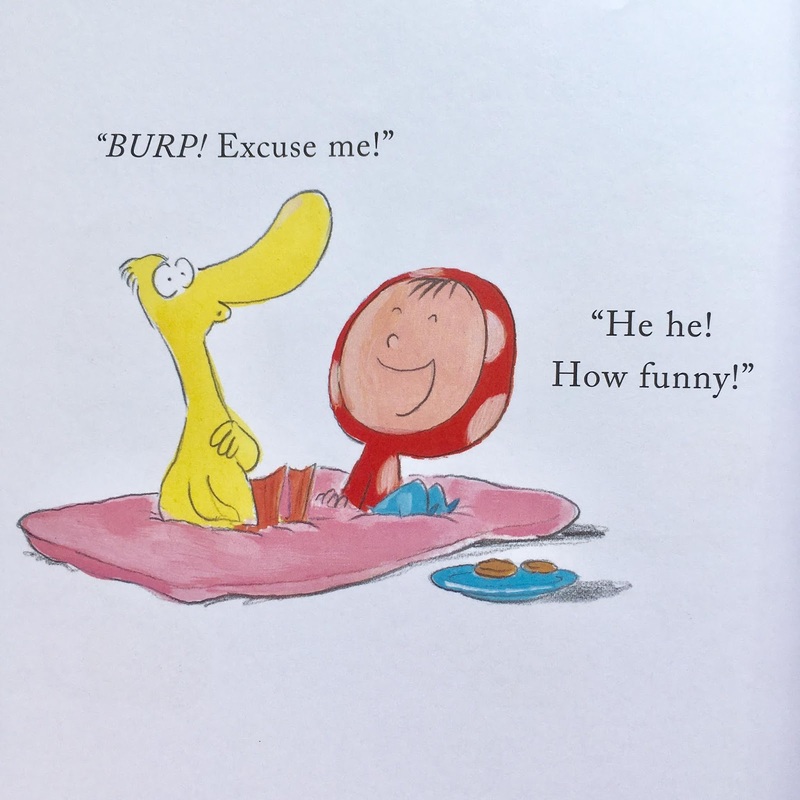 This book is a conversation opener to gently introduce little readers to manners and behaviours through this hilarious double-act. 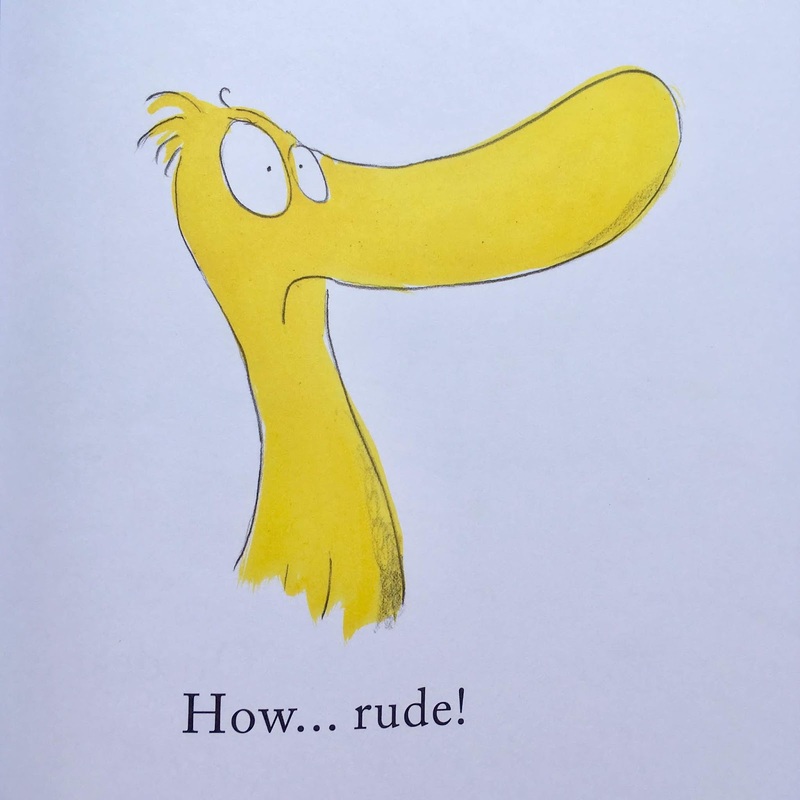 With sparse text and repetition of the phrase "How rude!" 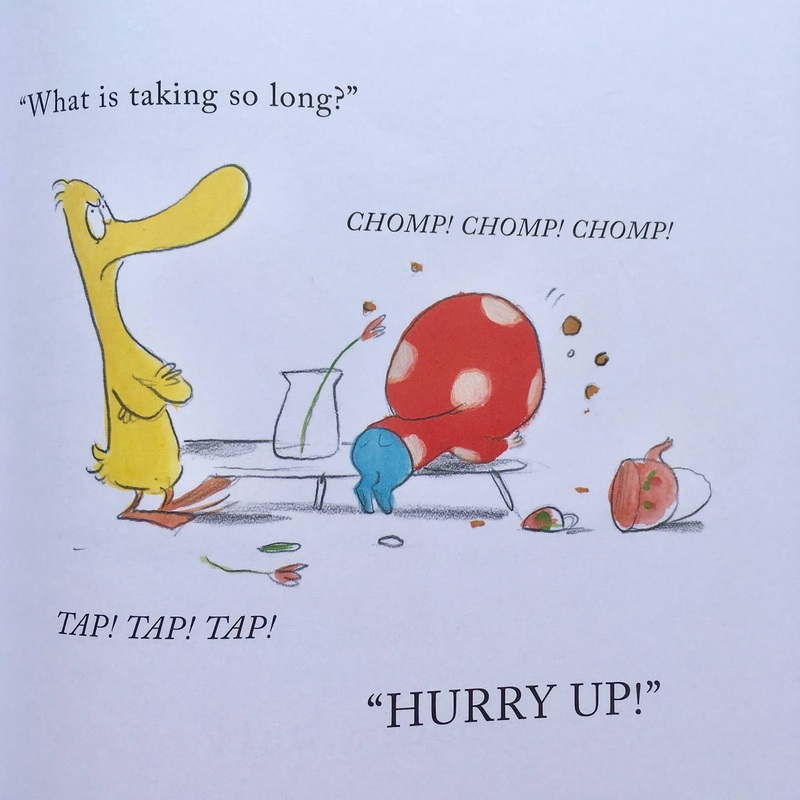 this is a lovely little stories for very young readers who are just starting to enjoy sitting still long enough for a story. And the illustrations are such a fun comic strip style! 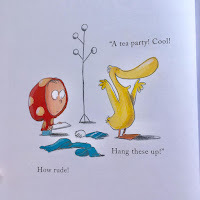 I don't think we have any other books with a similar style which makes it very unique and it's great for showing the bairns a different style of artwork. They strong colour palette and bold look to the characters against mostly white backgrounds also allow young readers to really see the action of the story without being distracted by background artwork. This could be seen as a very simple story. But with the clever artwork and hilarious use of such few words, this book is far from simplistic! Such a fun book! If you would like to win a signed copy of How Rude! please pop over to my Twitter to tell us the strangest sandwich filling you've ever had before 4.10.18 to enter. I'll pop a link to the Tweet below (once the competition goes live). 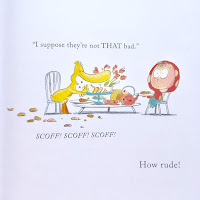 I've got a signed copy of hilarious manners tale How Rude! to giveaway. To enter: Follow @BookBairn and @ClareHelenWelsh & RT. And comment below with the weirdest sandwich filling you've eaten. And check out the other stops on the blog tour too! How Rude! is released on 4th October so make sure you check it out! 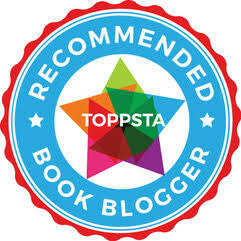 DISCLAIMER: I was sent the book free for review purposes by the publisher as part of my participation in the blog tour. Words and opinions are as always my own. If you are interested in pre-ordering a copy of the book or ordering it if you are reading after release date on 4th October, I have popped affiliate links where the title is mentioned and in the final photo. This means that if you choose to purchase on amazon.co.uk, I will receive a small sum (around 60p per book) from amazon at no extra cost to you. I understand that you may not want to use an affiliate link, but if you like reading our blog please just think of it as a small tip for a tip-off to an awesome book. And know that your support means I can buy more books! For more information check out our 'For Our Readers' section. Yes! It would be great for right before lunch time! Looks like an interesting layout for an interesting topic. It's a very rude pairing! And one that a lot of toddlers would benefit from! It's a fabulous idea to have a story told just through dialogue. 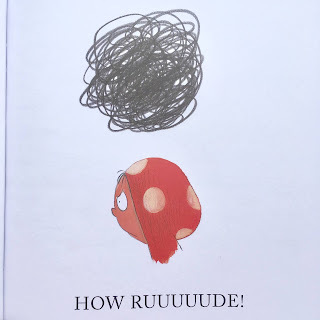 Clare has also written a great post for Story Snug's stop on the 'How Rude' blog tour next week. Thanks Catherine! 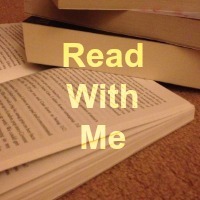 I'll pop over and read! I think it's a helpful reminder for everyone!